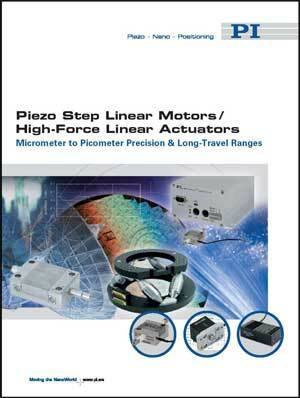 (Nanowerk News) PI (Physik Instrumente) L.P. – a leading manufacturer of ultra-precision motion-control and sensing equipment for bio / nanotechnology, photonics, semiconductor and life science applications – offers a new brochure on piezo ceramic linear motors. These motor actuators are non-magnetic, vacuum compatible and achieve significantly higher forces and resolution than other piezo motor designs, such as ultrasonic motors or inertial motors. The new linear motors are based on the patented PiezoWalk® principle and achieve forces from 2 kg to 60 kg per actuator. They are available in two versions called NEXLINE® (higher force) and NEXACT® (smaller, and faster). In addition to a long-range step mode, both also provide a very high dynamics sweep / scanning mode, enabling 50 picometers of resolution and kHz range bandwidth. These novel motor actuators are also available as drive systems in nanopositioning linear stages and multi-axis positioning systems, such as 6-axis Hexapods or tripod Z/tip/tilt platforms. PI is the industry leader in ultra-precision motion control devices for nanoscale manufacturing, test and research applications. PI has been developing and manufacturing standard & custom precision products with piezoelectric and electromagnetic drives for 35+ years. The company has been ISO 9001 certified since 1994 and provides innovative, high-quality solutions for OEM and research. PI is present worldwide with eight subsidiaries and total staff of 450+. PI – Moving the NanoWorld.